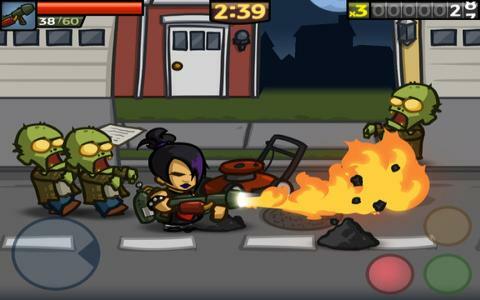 Zombieville is a simple, gore filled platformer in which you will be shooting as many crudely drawn zombies as you care to. The game is crudely drawn in all of its aspect: the backgrounds sport watercolor like, large stroke lines, while the enemies and your protagonist sport the same visual style. When you shoot a zombie, lots of gunk spouts out and the gore is really visual and quite disgusting. 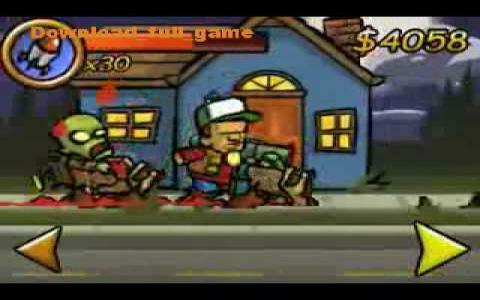 The animations are somehow well caught in the overall design style, with lots of cartoonish sway and a good way to depict the zombies. What the game doesn't offer however, is variation. Once you've made your way through a few dozen zombies, you've pretty much seen all there is to see. And thus, if you're looking for a more diverse game, this is certainly not it. But, if you want a zombie filled left to right parade, without much else, you'll certainly get it from this one. At times however, the little work and soul put into the graphic theme will just manage to bore you and to give you a feeling of game sloppily produced, or for the wrong reasons. But I let you be the judge of that.